Most information taken from Utah.com. The Olympic Mascots were a fun part of the 2002 Winter Olympic Games here in Salt Lake City. 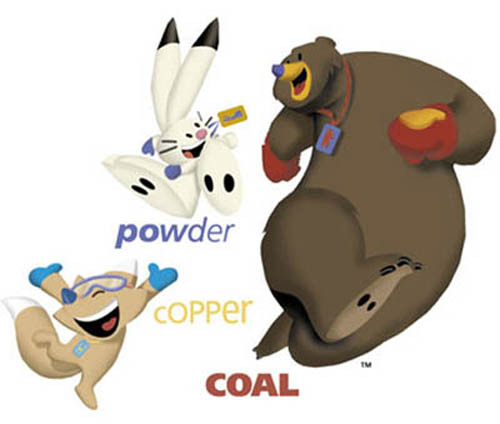 The mascots were based on petroglyphs and stories from Native American legends here in Utah. Their stories reflect the Olympic motto of Citius, Altius, Fortius, meaning Swifter, Higher, Stronger. "These animals appear as major characters in the myth and stories handed down for generations to modern day Native Americans, the descendants of the ancient artists who produced rock art," said Dr. Laurel Casjens, Utah Museum of Natural History. "I am delighted that the committee has seen fit to honor the cultures who first inhabited Utah and the surrounding areas by using their symbols to represent the modern Olympics." The mascots were unveiled at a ceremony at The Triad Center on May 15th, 1999, which marked one thousand days until the start of the games. Olympian Kristi Yamaguchi hosted the unveiling. Utah children suggested names for the mascots, and then put them to a vote. Their official names were unveiled at a BYU Football game on September 25th, 1999. Snowshoe Hare (Swifter): At one time, the sun was burning up the earth. The hare ran swiftly to the top of the mountain. Shooting her arrow at the sun, she dropped it lower in the sky and cooled the land. Named for the powder-like snow that Utah is famous for. Coyote (Higher): When the world turned dark and frozen, the coyote climbed the highest mountaintop and stole the flame from the fire people. He brought warmth back to the earth. Named for Copper, one of Utah's most precious metals. Utah is also home to the Kennecott Copper Mine. 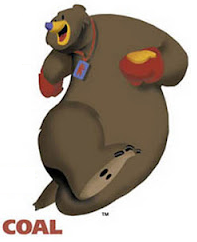 American Black Bear (Stronger): Long ago brave hunters left their villages to track the mighty bear. But the bear was too strong and outlasted the hunters. Today, sons of the hunters continue the chase in the night sky. Named for Coal, another one of Utah's most valuable resources. Read more about the 2002 Winter Olympic Games!